This past week has been an equal mix of excitement and down-time. Today is actually the first sunny and hot day in a while as most of this week has been rainy and stormy. Despite the weather, I found time to check out an awesome vegan spot near College Park and catch up on some sleep. Last Sunday Jesus and I made the adventure to NuVegan. I was super excited to find another person who not only embraced the vegan diet but also enjoyed good food as much as I do. The NuVegan food was especially delicious. They had all kind of soulfood options and everything was cooked to perfection. I ended up getting the vegan crabcakes, mac and cheese, and potato salad. I also got a cookie, and a raspberry cream shake. I was so full when we left there I could barely walk! On the trek back we noticed it was starting to rain again. At first it was just a drizzle but soon enough we were caught in a full downpour. With a 10 minute walk ahead of us and one shared umbrella we decided to catch a Lyft. Despite the long distance and getting completely soaked, I can still confirm it was totally worth the trip. Tuesday we got up and headed to NIST a little early in the morning. Mostly everyone was pretty tired and slept on the hour and change Metro ride to Gaithersburg, MD. After arriving and resurrecting ourselves with some coffee, we received a very entertaining and somewhat improvised presentation from Jesus’s mentor Mr. Yaw Obeng. He helped us better understand what NIST was about and some of the things they were researching there. Perhaps the most interesting thing he discussed was using water as a dielectric. It seemed contradictory, but in a very thin layer it can be used as an insulator for electrical current. We got a tour of many different labs and learned about things like nanotech, AFMs, and a big box with a controlled environment. 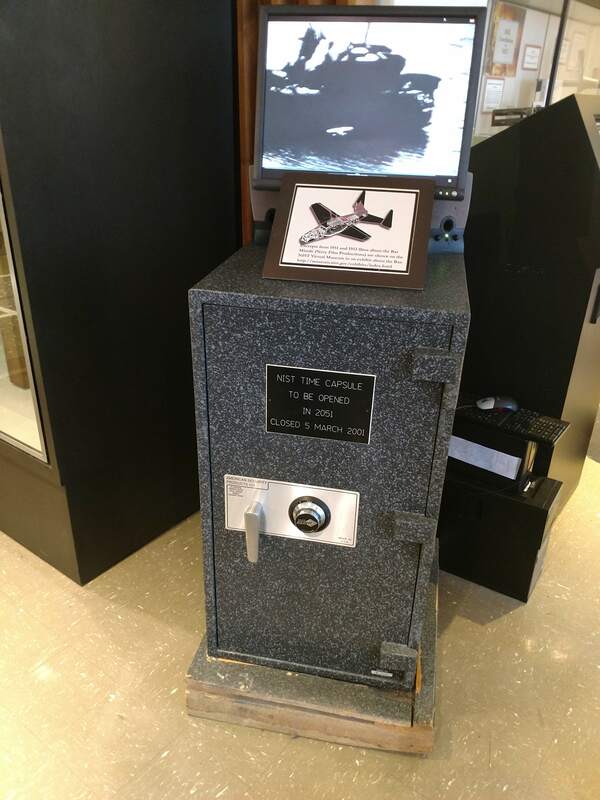 In addition we took a tour of the museum where we saw a replica of the first neon sign, a model of the case holding the declaration of independence, and a missile design once guided by pigeons. 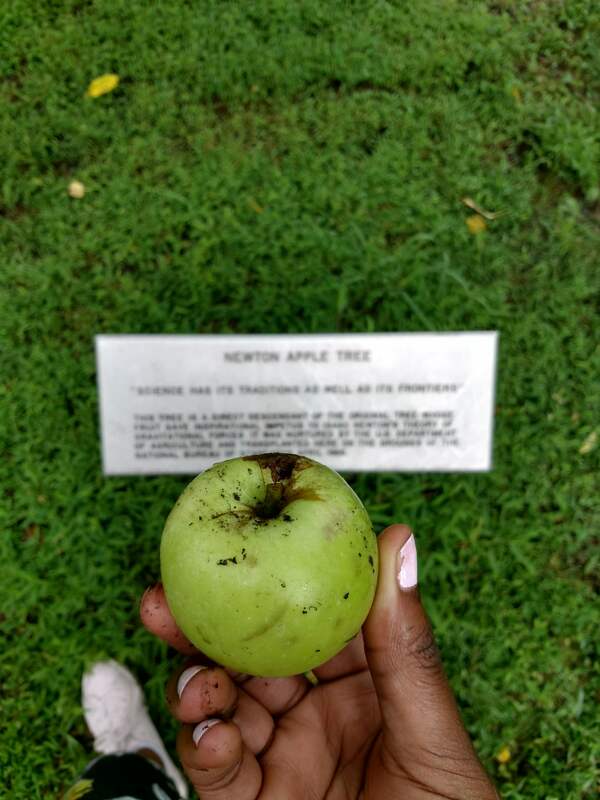 Outside of the museum library area we got to see an actual clone of Isaac Newton’s apple tree! The same one that is infamous for dropping an apple on his head and inspiring his laws of gravity. Many of us took photos under the tree, pretending to ponder things. I haven’t checked in, but as far as I know none of us have had any epiphanies about the laws of physics (hopefully just standing under the tree gave us some good luck though!). 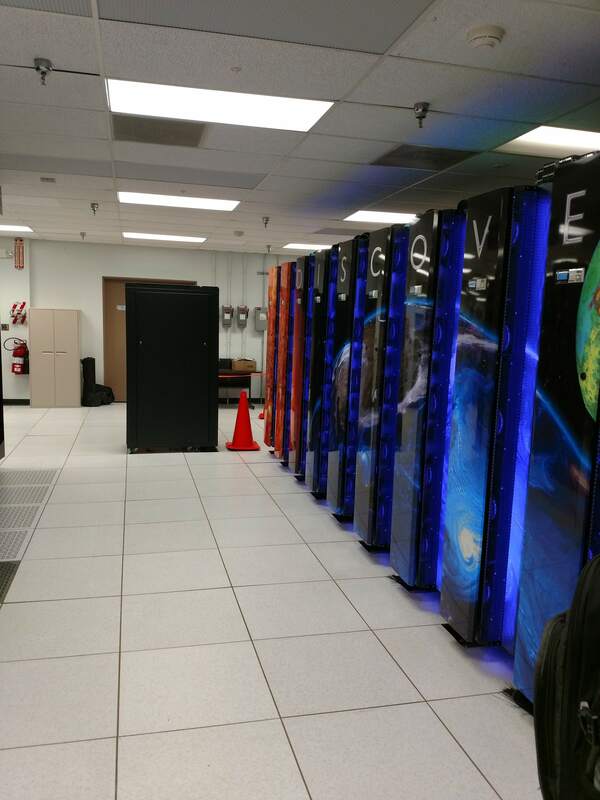 On Wednesday, we toured NASA Goddard in Greenbelt, MD. It was another early start but I was super excited to visit a NASA campus! We started by walking around the Science Jamboree until lunchtime. 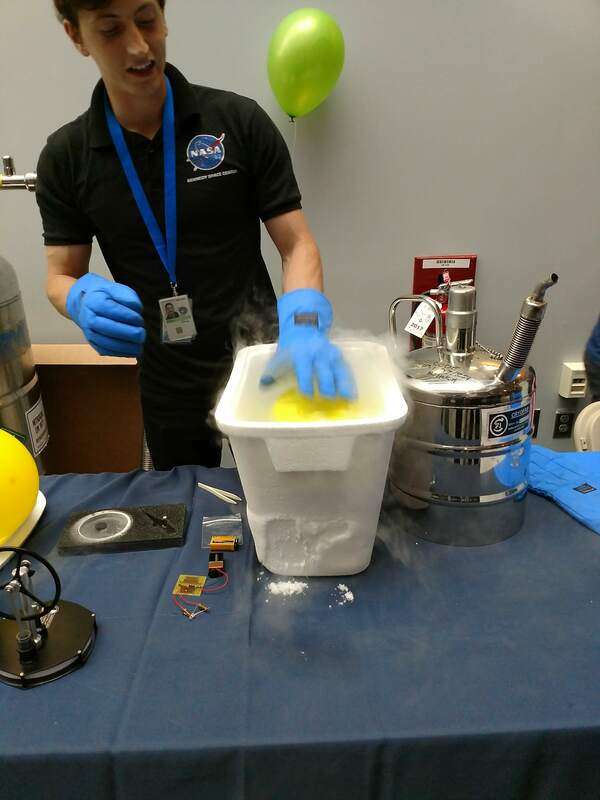 There we got a huge dose of all the different projects going on at NASA and there were tons of super cool demos. I learned a lot about initiatives like WFIRST (an infrared space telescope seeking out dark energy), and LISA (a collaborative effort between ESA and NASA to more accurately measure gravitational waves), Juno (a mission launched in 2011 to learn more about Jupiter’s composition, gravity field, magnetic field, and polar magnetosphere) and plenty more cool acronyms. There was even a VR booth. The VR was a simulation of a NASA lab where you could walk around and work on a satellite or just destroy everything like Daniel and Collin did. 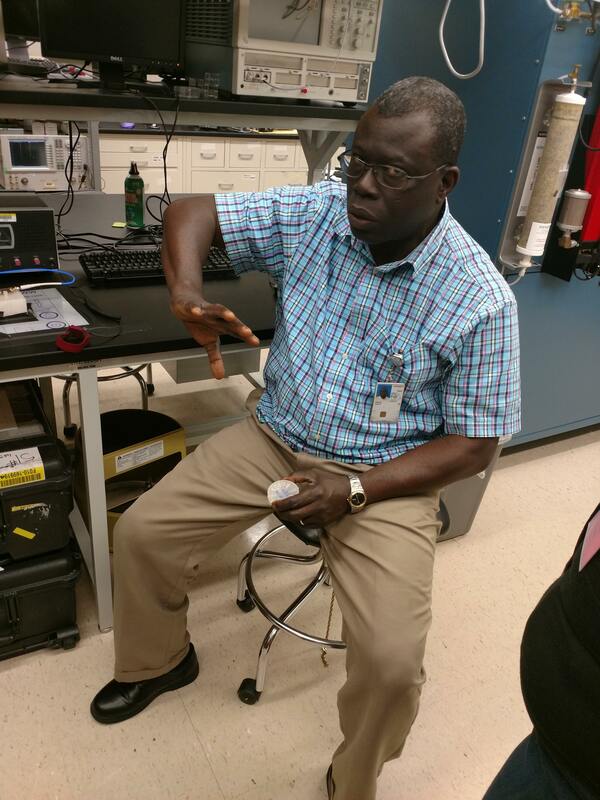 After a delicious lunch of jerk tilapia, rice and peas, and patty from a Jamaican food truck, we all headed to visit some actual labs. One of the labs we visited had a super cool collection of wires and metal called SAM (Sample Analysis at Mars). Using SAM, NASA scientists can conduct experiments on Earth before they do it with the Curiosity. This way they can avoid any major damage or failure. One of the wildest things I learned is how outdated the SAM technology is. In fact, the reason most of the NASA technology seems a little outdated is because it has to go through a process of approval which could take many years. That essentially “freezes” it in one generation of technology. However SAM still works really well and they’re currently in the process of upgrading the tech, making it more compact and efficient. We also got see the labs where Daniel and Collin work. 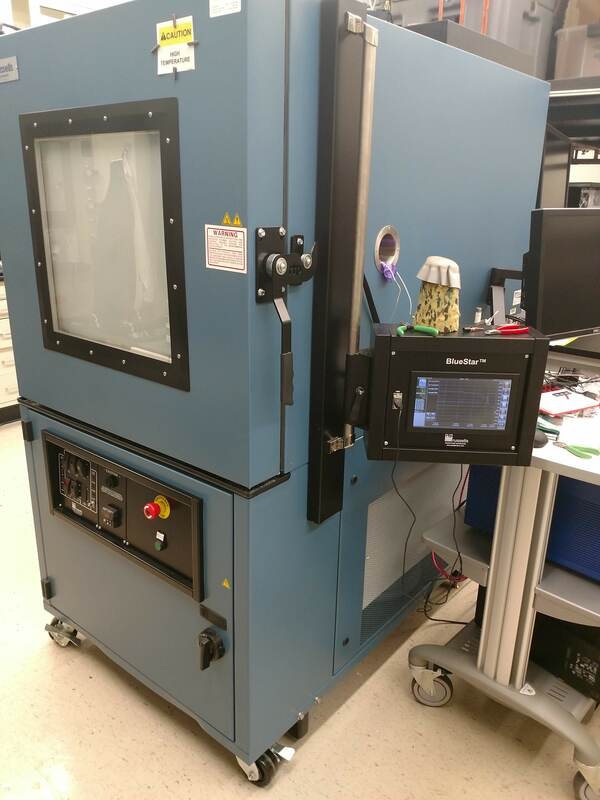 Collin’s lab was full of all kinds of instruments and electronics including an apparatus simulating potential exoplanet climates at really high temperatures. 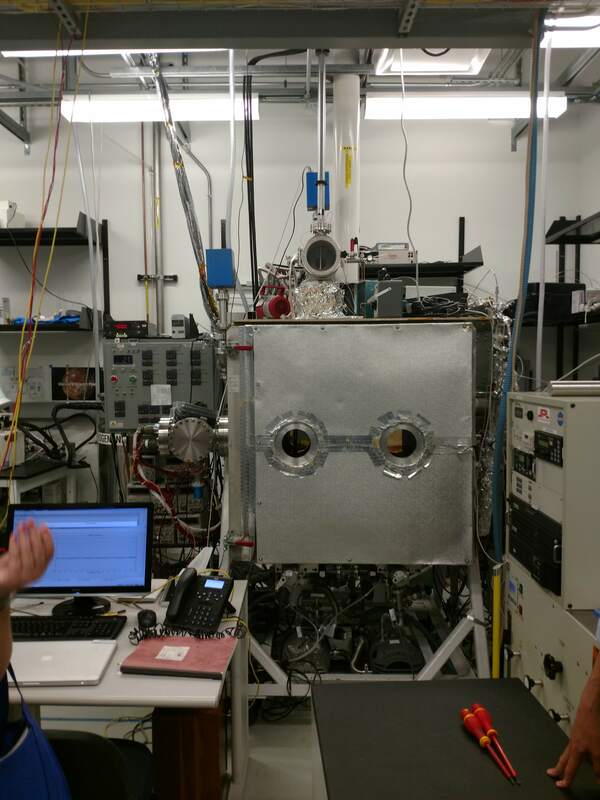 In retrospect, Daniel’s lab had a cryostat that operated at an extremely low temperature: about 0.3 Kelvin. This, along with helpful computer programs like COMPSOL, help in understanding the CMB, or Cosmic Microwave Background. We also received a very inspirational talk from Daniel’s mentor Dr. Edward Wollack. He’s a very intelligent individual who told us all about the history of the universe and important life lessons. Lastly, Thursday morning when returned to work after what seemed like forever I was pleasantly surprised to find the final printed version of my poster. It looks so awesome and after approval from Marketing and my mentor I am happy to say the first 200 copies will hopefully be distributed around the country at conferences, in classrooms and at universities. It’s sad to think my time here is coming to a close, but I’m excited to take the experiences and lessons I’ve learned and apply them as my undergraduate career comes to a close. I appreciate you reading these blogs posts, no matter how unorganized. I hope you’ll stay tuned for the last two weeks!